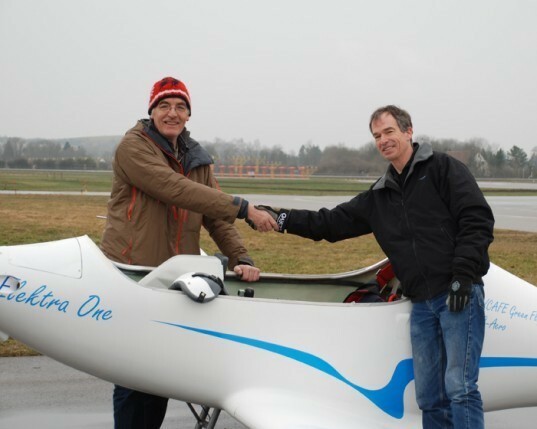 We’re excited to announce that the Elektra One electric airplane has just successfully completed its first and second flights in Augsburg, Germany! Developed by Calin Gologan, the electric aircraft endured a 30 minute emission-free flight. The Elektra One climbed to a height of 1,640 feet at 400 feet per minute, and it handled very well according to test pilots Jon Karkow and Norbert Lorenzen. It also only expended three kilowatt-hours of the total stored six kilowatt-hours available. Gologan developed the Elektra as part of a zero emissions flight plan. He has also designed a solar-powered hangar to house the aircraft, whose 28 foot wingspan is covered with 215 square feet of solar cells. With solar and electric power combined, the Elektra could fly around 300 hours a year. The ultra lightweight aircraft weighs just 220 pounds, plus an additional 220 pound battery pack. With a 660 pound weight capacity, there is ample room for a more than just the pilot. Aside from sustainable energy, Gologan had noise restrictions in mind when developing the Elektra, as many European countries strictly limit noise pollution. Impressively, the Elektra is almost completely silent — its propeller spins at only 1,400 RPM at cruising altitudes. The Elektra One, hangar, and power pack will sell for around $140,000 for the entire package – not bad for a personal plane. Gologan plans to develop two and four seat models once the Elektra is fully tested and perfected. Electric flight offers a lot benefits. You reduce the complexity of the craft when you remove the engine. With fuel tanks gone, the balance of the craft doesn't change as fuel tanks empty. There is also the noise factor. Unlike cars, the distance limitations of the batteries and re-charge time would not be as much of an issue. You fly in to somewhere, stay for a day, leave the next day. You have plenty of time to recharge. We're excited to announce that the Elektra One electric airplane has just successfully completed its first and second flights in Augsburg, Germany! Developed by Calin Gologan, the electric aircraft endured a 30 minute emission-free flight. The Elektra One climbed to a height of 1,640 feet at 400 feet per minute, and it handled very well according to test pilots Jon Karkow and Norbert Lorenzen. It also only expended three kilowatt-hours of the total stored six kilowatt-hours available.